Tippi Hedren has been haunting me the last couple of weeks, even though she is quite alive, and we have never met. First I blame NPR, which is always blabbering away on my radio, like some smarty friend who always knows more than I do. There was a story about her crazy family making a movie called Roar, where they all lived with over 150 lions, tigers, and cheetahs, and many of the cast and crew were severely injured. While the movie was a disaster, Tippi continues to work for animal causes and created The Roar Foundation. Then, there was another story about how Tippi Hedren is largely responsible for all of the Vietnamese nail salons in America. After the Vietnam War she actively looked for a way to help all of the refugee women. The ladies loved her nails, so she brought her manicurist to show them all how they were done. She taught them a valuable skill, and literally changed the economy for a large population of female entrepreneurs. So, I have Tippi on the brain, and I’m running some errands on Melrose. I stop at a vending machine to possibly get a snack, when I realize that it’s a beauty vending machine. 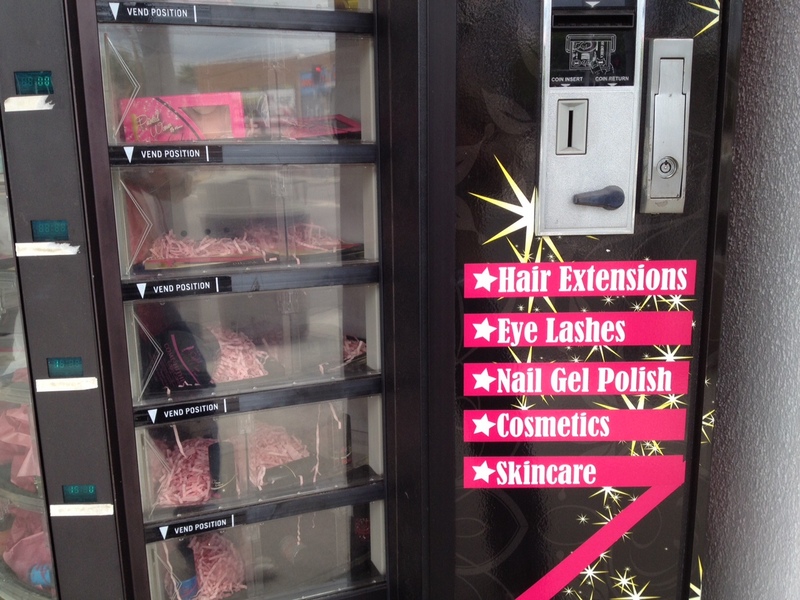 It is filled with hair extensions, fake eyelashes, and nail polish. I really just wanted some chocolate and hadn’t considered an afternoon of drag, so I continue on to my car. I take a seat in my car and leave the door open and check my phone messages before I leave. As I’m looking down at my phone, I feel something fly right by face and to the passenger seat. As I look over at the large bird sitting to my right, another bird flies into my open door, right by my face, and both birds start flapping around in my car. I do what any adult male would do in this situation. I jump out of the car and scream like a girl. I’m screaming and running around the car opening all of the doors from the outside, when I notice a woman carrying her groceries into her house. She doesn’t even look at me. I could have had rapists in my car, not birds, and this woman couldn’t have known any different or cared any less. I continue to scream and swat like Tippi Hedren in The Birds until the devil beasts leave my car. I get home and pull myself together and I’m sitting on the couch. I start to tell Albert about what happened in the car, and how I’m quite sure that Tippi Hedren is somehow responsible. I am clearly conjuring Melanie Griffith’s 85-year-old mother. Just then SMACK a bird hits the window outside, directly behind my head. Oh. My. God. Tippi! 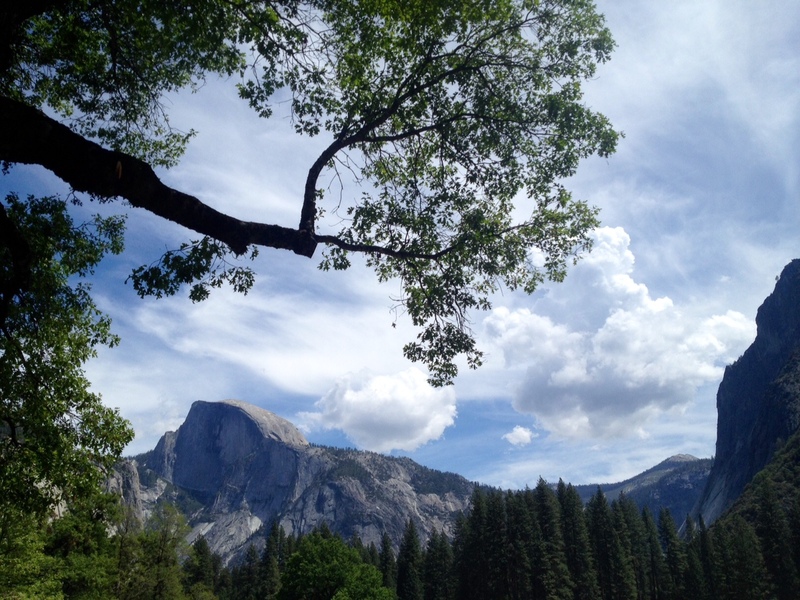 Albert and I recently visited Yosemite Nation Park and it is stunning. Yes, I took a beautiful picture of one of the most fantastic panoramic views this country has to offer, but it doesn’t even begin to capture the overwhelming scale of this place. You absolutely must experience it first hand. We hadn’t even left yet, and we were already doing it wrong. First, let me say, for doing it wrong, it was still an unforgettable, beautiful trip. Second, after seeing how massive the park is, and how the South Gate was still an hour and a half from all of the activity in the Yosemite Valley, I realized that we were totally doing it wrong. The park is celebrating its 125th Anniversary this year, which is also sort of amazing. Constructing the trails that climb for miles up granite cliffs, while also protecting the land, would be a feat today, with modern equipment. How this was done with dynamite, ropes, and horses, sort of blows my mind. They actually blew through the side of one of the mountains, just so cars would have to drive through a tunnel of darkness, like being shot out of a cannon, to exit on one of the most majestic views I have ever seen. The view stops you, stops everything. People from all over the world are walking around Yosemite with their jaws hanging open, just looking at all the splendor. I have been to the Great Smokey Mountains, the most visited National Park, as well as Zion, Joshua Tree, The Petrified Forest, and, of course, the Grand Canyon. Yosemite is now at the top of my list of parks I want to return to for more hiking. If you have any interest in nature, get in your car and take a drive to one of these places. They are OUR parks, politically neutral, carved out by God and nature, and they give me American pride. Look what we can do! Thank you, Theodore Roosevelt.